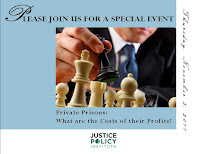 Our special event committee and our board has been planning to make this event a memorable one for our attendees who believe private prisons are the wrong answer to prison overcrowding, the wrong answer to assuaging states’ in-the-red budgets, and the wrong answer to politics as usual. We have gone the extra mile to find a panel that could truly address the title of the event: “Private prisons: What are the costs of their profits?” We have worked hard to find a panel diverse in their experiences, advocacy efforts, legal successes, and ongoing attention and coverage of the issue. Our all-star lineup will be joining us from around the US. Joining us from Nashville will be Alex Friedmann who served six years in a Tennessee private prison and currently is the co-editor of the Prison Legal News, a monthly magazine devoted to reporting on prisoner issues, court proceedings and civil rights. New to Miami and the state where private prisons seem to be becoming a mainstay, is Gail Tyree, who is an reform advocate and Soros Fellow who has done major on-the-ground work in private prison advocacy. Working in New Orleans, Sheila Bedi, deputy legal director for the Southern Poverty Law Center, focuses on juvenile justice issues, and in 2010 filed a joint law suit on a private youth facility in Mississippi. The DC contingency of the panel includes, Joshua Miller, labor economist for the American Federation of State and County Municipal Employees, who will talk about the union perspective for state prison employees; Emily Tucker, director of policy and advocacy for the Detention Watch Network, who will speak to the fact that immigration officials are looking to use private prisons on a more regular basis to detain immigrants; and staff attorney David Shapiro, ACLU National Prison Project who litigates cases involving prison conditions and other issues. The National Prison Project joined SPLC in the conditions lawsuit. Representing JPI will be researcher, Paul Ashton who wrote “Gaming the System: How the Political Strategies of Private Prison Companies Promote Ineffective Incarceration Policies," a report that focused on private prison companies’ lobbying efforts and campaign contributions which continues to receive traction in the media following its June release. Tracy Velázquez, JPI’s executive director will moderate the discussion, making sure to touch on the various aspects and angles that impact our collective work and goals. I’m also very excited that we are hosting the event at the Lamont Bishop Gallery in Washington, DC. The Lamont, as we have been calling it around the office, is located in the Mt. Vernon Square/Convention Center neighborhood which is the entry point to downtown. The mission of the gallery is to unite the nation’s emerging contemporary artists with budding collectors. During our special event, attendees will be able to take in an exhibit that hones in on various DC-area events through photography appropriately during FotoWeek DC. Also adding to the pot of a great panel and location will be the food that is catered by the locally owned and operated Brookland Café that will be catering the cocktail reception with treats. We will also serve a signature drink for attendees to enjoy (the name will be unveiled at the event). This is particularly a serious issue that we advocates and researchers will be tackling for years to come. This event is also serving as JPI’s first fundraiser in an effort to continue our work on this and other crucial issues. An event like this will allow like minds and those interested in the issue to come together, listen, discuss and make a plan of action. We are also inviting students to attend at a special rate. Oh, and as an added thanks for your support, attendees will receive takeaways that will prove useful in your work, including a flash drive pre-loaded with everything you'll want to know about private prisons. I hope you can join us for the event. But, more importantly, I hope you join the movement to reform. To RSVP for the event or to make a contribution in your absence, email rsvp@justicepolicy.org or visit www.justicepolicy.org and go to the contribution page.